I’m glad Colombia is still on my bucket list. It gives me something to look forward to. March 12, 2015, 2:39 p.m.
To travel is to stir the pot of curiosity. March 5, 2015, 12:53 p.m.
As someone who is fond of snacks, I’ve been quite pleased with what’s on offer in Colombia. Feb. 26, 2015, 2:13 p.m.
To travel is to stir the pot of curiosity. Put another way, travel swings open the door to new experiences that can challenge and broaden our understanding of the world. In Colombia, there are countless things about the country I didn’t know (and probably so many more I still don’t know I don’t know). And, during my time here, I’ve also learned a thing or two about myself. When people think of the Amazon (myself included), they usually picture mighty rivers, verdant rainforests, and diverse wildlife. Of course, the Amazon is all of those things, but its waters actually begin to flow from the high Andes. In fact, Mount Yerupajá, the soaring 6,635 metre (21,768 ft) summit, is the highest point in the Amazon River watershed. From there, the waters drain east, gathering runoff from the Guiana Highlands to the north and the Brazilian Highlands to the south–all the way to the Atlantic. Feel free to share that factoid at your next cocktail party (people will be impressed). What have I learned about myself while travelling with team opxColombia? In truth, I’m half lone-wolf, craving the solitude of writing and trail running. But as much as I cherish my alone time, I really like working with a team, especially one as experienced and fun as these blokes. Team travel requires, well, teamwork, which adds another layer to the travel experience—whether it’s negotiating personalities and communication styles or sharing duties on a white water adventure. It’s all fodder for learning! History is a complex thing: who writes it, who guards it, who transmits it. Colombia, of course, is no exception. During my research I came to learn that with the unexpected arrival of the Spanish, another presence soon appeared on Colombia’s shores. The Inquisition. In 1610, the Catholic Monarchs set up the Inquisition Holy Office Court in Cartagena (issued by King Philip II). It was one of three seats of the Inquisition in the Americas, along with Mexico and Lima, Peru. The sole purpose of the inquisition was to hunt down those deemed to be witches and heretics. 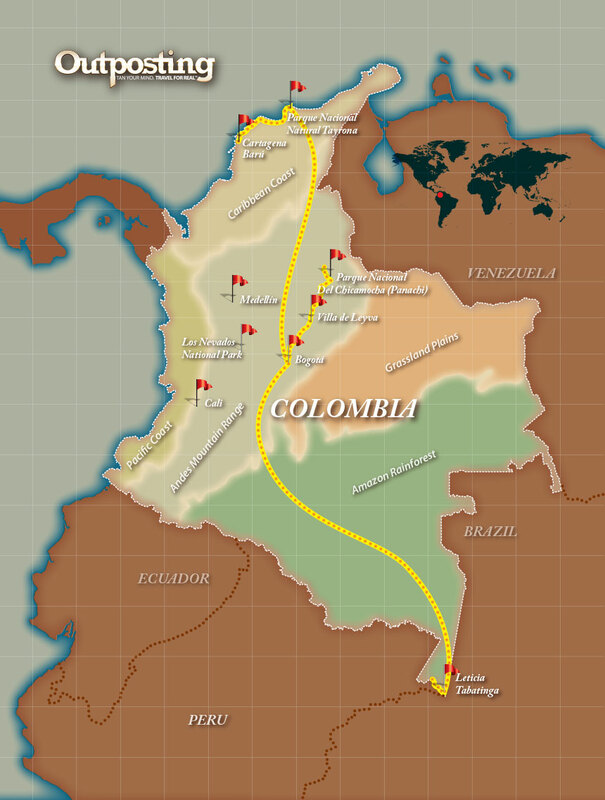 That uphappy chapter finally came to an end in 1821 when Colombia achieved independence from Spain.